Suitability: PG / HG Pilot Rating + 100 hours. Experienced NDHPC CP pilots may fly the site, however it is strongly advised that this is at the discretion of an experienced Trentishoe pilot and that they have had a thorough pre flight briefing. When suitable conditions arise we will invite less experienced pilots to meet on site for a briefing and if conditions are appropriate for them to fly. It is strongly advised that all pilots (visitors and experienced pilots) fly with an experienced Trentishoe pilot and have gone through a through pre flight briefing. If you are intending to travel and fly at Trentishoe, please ensure you call the Low Flying Booking to register at CANP before 8pm the evening before. 0800 515 544. The alternative number is 01780 416001. The Bristol Channel is regularly use by the RAF during the week and Hercules do sorties low over the coast line in this area. From the A39 at Blackmoor Gate, follow the A399 North West towards Combe Martin. After 2 miles you will see a signpost for “Trentishoe & Hunters Inn”. It is a narrow lane so beware of oncoming traffic. Follow this road 1 mile to Stoney Corner and take a sharp right, followed by a sharp left that takes you onto the road up to Trentishoe Downs. After 2 miles you will come over the top of the common and see the Bristol Channel in front of you . There is a parking area on the left hand side just off the road. If this Car Park is full there is an alternative car park another 1⁄2 mile down the road on the left hand side. Trentishoe is a coastal cliff site and therefore we recommend you rig behind take off. There are two take off areas. Either below the road or above the road. Paraglider pilots generally launch just below the main car park. Follow the track down and to the left, crossing over the small wall. You can launch anywhere below this point down to where the coastal path runs parallel with the hill (see map marked in green for take-off areas). It is possible to land on top of Trentishoe Downs or to the right hand side (east side) where there is a clearing. Beware that the hill drops off quickly and dramatically behind Trentishoe Downs so if the wind strength is above 10mph, Paragliders should land on the east side of the hill or consider side landing near the launch area. (see map marked in blue for landing areas). It is possible to land near and below the launch area (see map with blue markings). However, if possible do not land below the coastal path unless it is an emergency. This is a coastal site – there is NO BOTTOM LANDING. Ensure you have judged the conditions properly. With a north wind long coastal runs West to Combe Martin and East to Porlock are possible. The sea and the rocks will claim the careless! Strong winter thermals give opportunities to go over the back. However, note THERE IS NO BOTTOM LANDING. There is absolutely NO BOTTOM LANDING here. Be aware of the weather conditions as they can change quickly as this faces the Bristol Channel and the Welsh mountains the other side. Wave can occur so constantly watch the sky up wind. When the wind is off to the east or the west, it can start to funnel down the channel and quickly diminish any lift, ensure you ALWAYS have a top landing option within reach. As per the attached map, there is a road which runs close to take off and landing. Please be aware of any traffic and allow plenty of room and time as not to cause an incident or concern to road users. 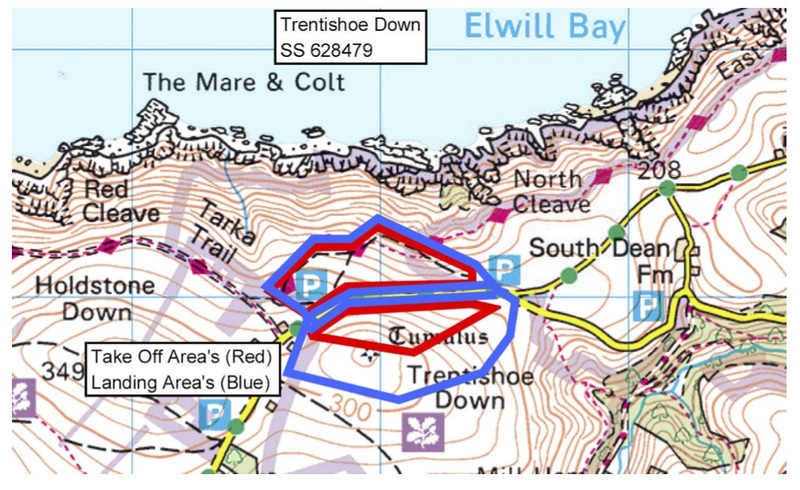 NORTH DEVON COASTAL PATH –Please be aware that the launch site is very close to the coastal path and there are walkers who frequent this area. NATUAL ENGLAND –SSSI The area at Trentishoe Downs is a Site of Special Scientific Interest with Natural England, which makes it a sensitive area in terms of usage and potential erosion. Please be aware that from Mid April to September warblers habitat in the under-growth . DO NOT land or launch your gliders outside of the marked areas below during this time and please minimize your impact on the environment.